Free EBook Offer - 10 Important Tips to Great Doll House Design! Our 23 page Dollhouse Free Ebook is an absolute "must read" BEFORE beginning your next Dollshouse Project. As well check out our most recent offer here. Especially if you are seriously interested in taking your creative skills to the next level. Start off on positive footing... never with a creative block: something akin to writer's block but in our instance, of the miniature project sort. When starting a brand new project, begin this or any other project with a positive attitude. A positive attitude is contagious. Encouragement is hard to find. More people tell themselves and others that a wonderful job or adventure-some project can not be had. However, we, like you, know this is not true. You CAN have more fun with dreams that are challenging than the straight laced ones. Dare to dream, we encourage you. At-the-Doll-House.com, we like to be a source of encouragement for you to find that, nearly impossible project, conquer it and make it yours. We put this Free EBook together to help people in general who have completed a Miniature Project in the past . . . need some motivation to start another . . . and for those that have never attempted one before. what is the best way to start your new project? does your mindset have anything to do with completing your project? could the way you think stand in the way of you enjoying the journey? what are your choices to consider? how much time do you need for completing your project? how much money will it cost to construct each phase? have you considered all areas of the design? have you worked all areas of your design into your plan? will you build your special house for an adult or a child? how much detail will you put into your creation?
. . . we have just described our 23 page free ebook. "10 Important Tips to Great Dollhouse Design". At one time it could be obtain on its own. Now it is provided through the facility of our latest offer which can be found here. What are 10 Important Tips to Dollhouse Design? In our free ebook we deal with issues in creating your miniature house BEFORE you begin. It's always best to ask as many questions as necessary prior to the actual construction of your dollshouse project. It motivates you to get all the details in the early stages of planning that are important to complete your project. We hope that by the time you have read our short booklet you will not be one who moans with, near pain, saying, oh why didn't I think of that in the beginning? and most importantly, who you will construct it for. You will also have a good idea how much it will cost. Fill in your details below and download your Complementary 10 Important Tips to Great Dollhouse Design. Along with our newest must have special current offer! Plus occasional miniature product updates. We hope that you will find it an encouragement, motivating, useful and inspirational. Don't worry there is no catch with this offer either. By filling out the form below you will just get the info described on this page. Our complementary guide has already helped many people and we hope it does the same for you! 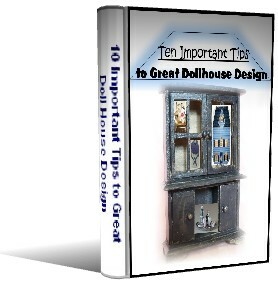 Get more dollhouse tips, our guide news, any upcoming updates, and a free copy of 10 Important Tips to Great Dollhouse Design! How developing your own dollhouse plans will help you get exactly what you want. Every time, all the time. How to get all the information that makes your plan work. And work well for the family heirlooms you design. How to build your dollhouse fast... Even when you're pressed for time. The easiest way to gain access to great plans online without spending a tonne of money. How to use this often overlooked "tip" to maximize your structural plans and save money that most people tend to forget about. Or think unimportant. Why THESE finishes will get the results you have been dreaming of. The steps needed to establish your choice way of developing your own dollhouse ideas. Today you CAN design your own dollhouse plans. And do it like the Pros. DECIDE WHAT YOU LIKE. YOUR TRUE DESIGN PREFERENCES. THEN DEVELOP AND FINALIZE YOUR OWN PERSONAL DOLL HOUSE PLANS. You CAN design Your Dream Dollhouse! You will be receiving an email that asks you to confirm your "subscription". Once you click the confirmation link in that email you will be taken to a special page on our site. That page tells you how to download the guide. As mentioned above, we will also send out special updates. If we make any changes to the information on the website, in the complementary guide, or even introduce a new guide we will let you know. The miniatures hobby information changes often and we would not want you left out on great ideas for your future creations. Your Free EBook is packed with inspiration and encouragement. We send out updates maybe once a month. If you don't want to receive those updates, just click the "unsubscribe" link that is included with every email. It's that Easy. Some of the products listed here do seem strange to reference in my EBook to you. However as you read it you will discover for yourself where each of them fit. So signup and check out My New Offer plus the Free EBook now.